In a previous life, Herman “Hank” Fins-Winston had been a golf pro—an excellent teacher of the game who never quite made it on the circuit, having missed his one real shot at greatness. He now lives in a lovely condominium on the thirteenth fairway of one of heaven’s 8,187 golf courses. God and His closest companions, you see, play the game often. And though Jesus never bothers to keep score, Buddha never takes a practice swing, and Moses doesn’t consider it cheating when he parts the courses’ water hazards, they all take the sport very seriously. In heaven, even God replaces His divots. Hank’s afterlife takes an unexpected turn when he is summoned to help a player whose game is in a slump. To his dismay, his new pupil is God Himself. Or Herself. Depending on the day. 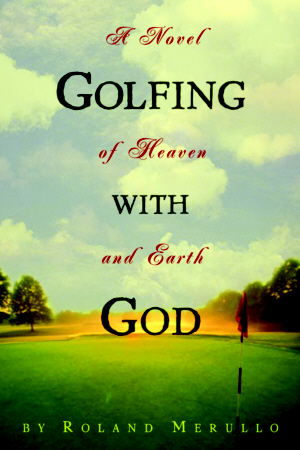 As they play the most heavenly courses in paradise and back on earth, Hank realizes that it’s he who’s learning the lessons—about fearing failure, about second chances, about the connectedness of all living things, about not taking the next breath for granted, and about our God-given ability to improve ourselves—one stroke at a time. — Jim Dodson, best-selling author of Final Rounds–A Father, a Son, the Golf Journey of a Lifetime.